Prince George of Cambridge will be christened by The Archbishop of Canterbury, Justin Welby, at St. James’s Palace on October 23. The choice of venue took the public by surprise because both Prince Charles and Prince William were christened in the Music Room at Buckingham Palace, which became a favourite venue for royal christenings after the palace chapel suffered bomb damage during the Second World War. The Chapel Royal at St. James’s Palace, however, has been the setting for key royal occasions since the reign of King Henry VIII. 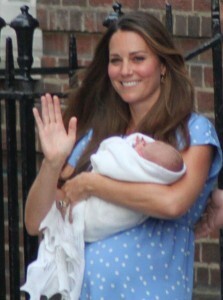 The upcoming christening will follow in a long tradition of royal events unfolding within the Chapel Royal. Today, St. James’s Palace is the administrative centre of the monarchy and the senior royal palace in the United Kingdom. The Accession Council meets at the palace to proclaim each new sovereign and British Ambassadors represent “The Court of St. James.” The palace did not enjoy this prominence when Henry VIII ordered its construction in the 1530s. Henry’s principal residence in London was Whitehall Palace and he intended for St. James’s Palace to be a secondary residence. Much of the palace was constructed on the site of a leper hospital dedicated to St. James the Lesser. The palace chapel was originally part of a nearby convent acquired by the King during the dissolution of the monasteries. 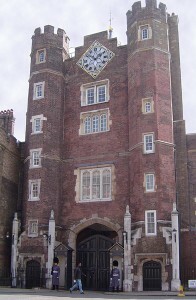 St. James’s Palace was completed in 1536. 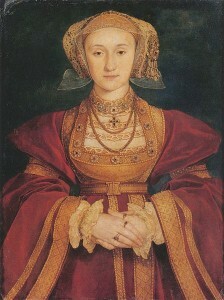 In 1540, Henry commissioned the artist Hans Holbein to decorate the chapel in honour of his fourth marriage to the German Princess, Anna of Cleves. Holbein had been a key figure in the marriage negotiations, painting the famous portrait of Anna that prompted the King’s proposal of marriage. Although the marriage ceremony itself took place at the Palace of Placentia in Greenwich, the adornments to St. James’s Palace were intended to celebrate the new Queen. Unfortunately for Holbein’s career, Henry was not attracted to the actual Anna as he was to her portrait and the marriage was annulled that same year. Holbein continued to work as an artist at court but he received fewer royal commissions after the failure of the King’s 4th marriage. St. James’s Palace continued to be a significant royal residence during the Tudor period. Two of Henry VIII’s children, Henry Fitzroy and Queen Mary I, died in the palace and the heart of the Queen is buried under the choir stalls. Elizabeth I reputedly prayed for the success of her fleet against the Spanish Armada in the Chapel Royal in 1588. 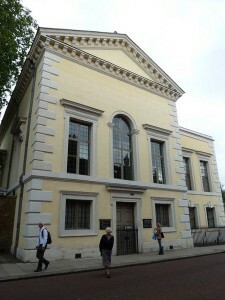 The Queen’s Chapel, designed by Inigo Jones for Charles I’s consort, Queen Henrietta Maria. Inigo Jones, a favourite architect of James I’s late wife, Anna of Denmark designed the new Roman Catholic place of worship and Charles I’s bride brought her own chapel furnishings from France. Although there was widespread public concern that Henrietta Maria would encourage her husband to convert to Roman Catholicism, Charles I remained a devout member of the Church of England and received in his last Communion in the original Chapel Royal in St. James’s Palace before his execution at Whitehall in 1649. During the interregnum, Lord Protector Oliver Cromwell made clear what he thought of Henrietta Maria and her religion by using the Queen’s Chapel as a stable. Henrietta Maria’s chapel became a royal chapel once more in 1938 and the remains of Queen Elizabeth, the Queen Mother remained there during the preparations for her lying-in-state in Westminster Hall after her death in 2002. After Whitehall Palace was destroyed by fire in the reign of King William III, in 1698, St. James’s Palace assumed its current role as the administrative centre of the monarchy. Although William preferred to live at Kensington Palace because of his asthma, George I, George II and George III all used St. James’s Palace as their principal residence in London during the eighteenth century. At this time, the Chapel Royal became a significant cultural centre. 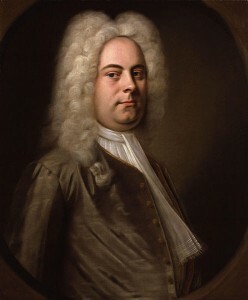 George Frederic Handel was appointed ‘Composer of Musick of His Majesty’s Chappel Royal’ in 1723 and he composed the music for the coronation of King George II in 1727. 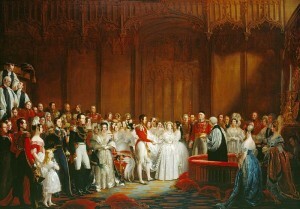 Queen Victoria married Prince Albert of Saxe-Coburg-Gotha in the Chapel Royal at St. James’s Palace in 1840. The chapel has been renovated in 1836 to include oak paneling and a high ceiling. The overjoyed bride wrote in her journal, “His beauty, his sweetness & gentleness – really how can I ever be thankful enough to have such a Husband! … to be called by names of tenderness, I have never yet heard used to me before – was bliss beyond belief! Oh! 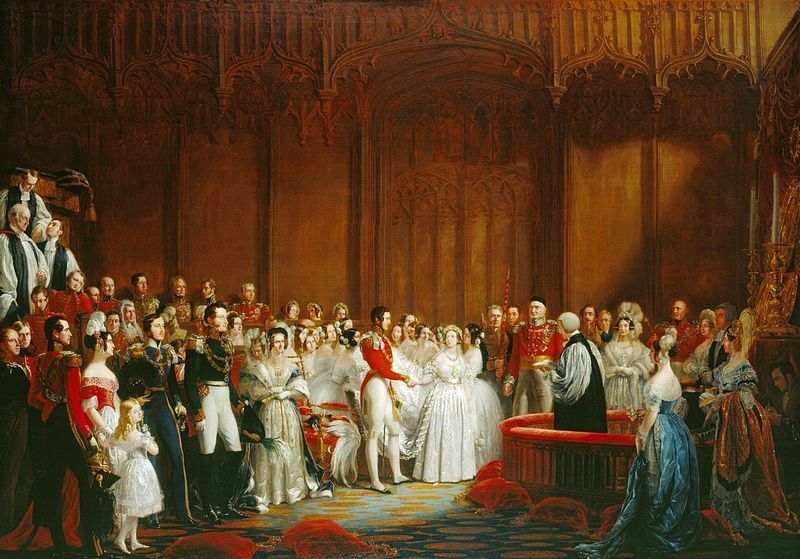 This was the happiest day of my life!” In addition to ensuring the Queen’s happiness, the wedding also had worldwide social significance as Victoria’s choice of a white wedding gown with fresh flowers has influenced bridal fashions to the present day. In contrast to the Georgian monarchs, Victoria did not use St. James’s Palace as her residence, preferring Windsor Castle and the newly enlarged Buckingham Palace as official homes for her growing family. Nevertheless, the Palace continues to be the setting for royal events to the present day. The children of Queen Elizabeth II’s cousin, Prince Michael of Kent, Lord Frederick and Lady Gabriella Windsor, were christened in the Chapel Royal in 1979 and 1981 respectively. The Queen’s granddaughter, Princess Beatrice was also christened there in a ceremony conducted by John Habgood, Archbishop of York, in 1988. The Duke and Duchess of Cambridge have chosen a setting for the christening of their son Prince George that has a long and colourful royal history. For Prince William, the choice of the Chapel Royal also has profound personal significance. In September 1997, the coffin of his mother, Diana, Princess of Wales was placed before the altar of the Chapel Royal so that family and friends could pay their respects before the funeral at Westminster Abbey. By choosing the Chapel Royal as the setting for Prince George’s christening, William and Catherine are honouring the late Princess of Wales in addition to their son’s destiny as heir to a thousand year old monarchy. 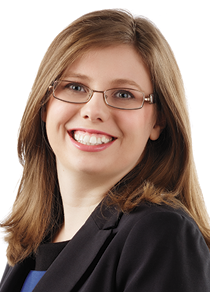 Click here to read my interview with Ruth Dunley of Canada.com about the christening arrangements for Prince George of Cambridge. Is it possible to attend a Sunday church service at the Chapel Royal, St. James’s Palace? I will be in London this coming Sunday, and would like to do so if it is possible. Johan Joakim/ J Wilhelm Mecken/ Mecke/ Macken came from Denmark with Prince George on his marriage with Anne. He died in 1711. One source says he died in London another source says Copenhagen. Both cite 1711 as the year of his death. If he is buried at the Royal Chapel at St. James, that would decide which source is correct. By any good luck can you tell me is his place of birth? Please I need info. I believe my great – great grandfather Kuper, Chaplain to Queen Victoria, and the Royal household, is buried there! Can you please confirm and let me know if I can visit? Can I have confirmation that Kuper is buried at the Chapel Royal, and can I visit?